Hot weather and bright sunshine gives me no excuse to look any less cool and elegant with my year 1938 dress creation. 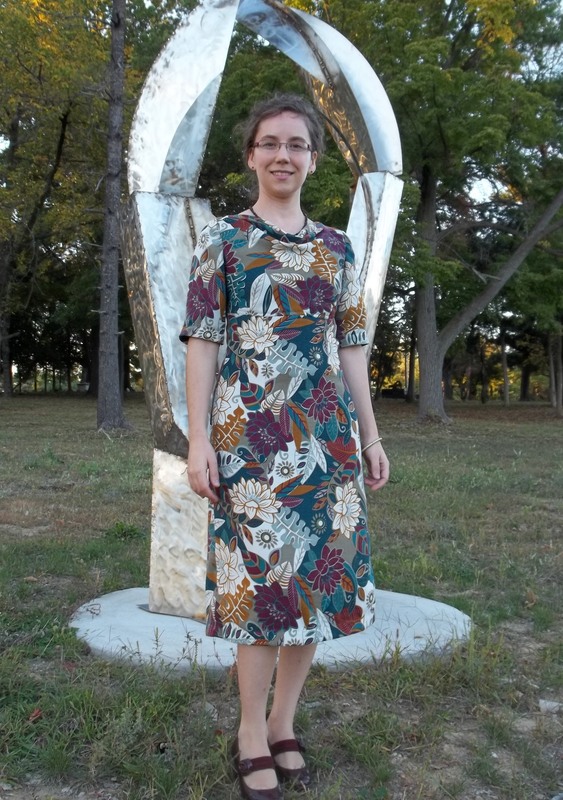 Now I also have a frock for the upcoming fall weather, as well. The neutral tones work perfectly with blazers and cardigans for cooler temperatures. Yay for multi-season sewing! As my dress is made of lovely rayon challis, the drapey, loose bodice is actually cooling and the high neck feels like I’m wearing a soft ascot to catch the extra sweat at my neck. For the cool temperatures, the neck will keep me cozy. The bias skirt is not at all restricting, moving with me at every step making me aware of the understated elegance of pre-War 30’s styling. I am writing this post thanks to the help of another blogger, the awesome Emileigh at “Flashback Summer”. When I had a question about my dress, I couldn’t think of anyone better at addressing cultural influences and its history, especially when it comes to being part of vintage fashion. 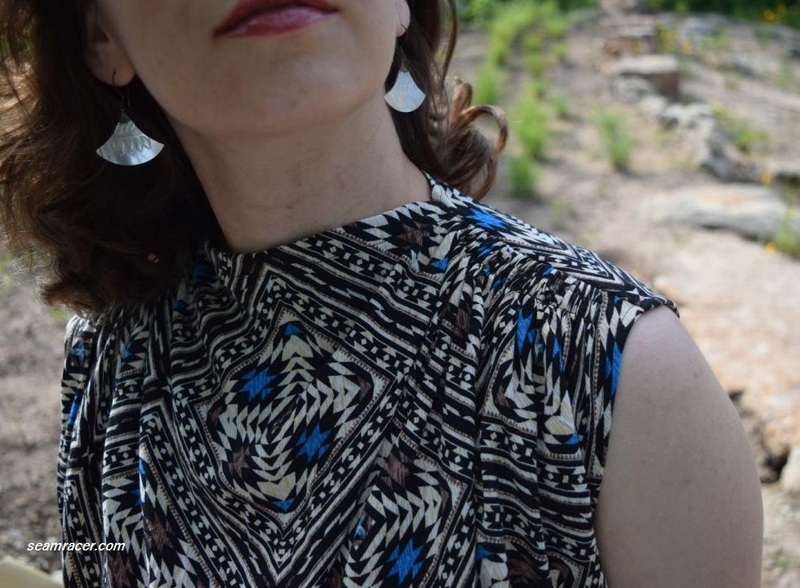 Thus, at my sending a query, she helped me recognize the Native American flair to my chosen fabric, seeing the geometric jagged triangle/diamond shapes and color scheme. She recommended this site to see the similarities. NOTIONS: I had all the thread needed, as well as the side closing notions, then I used vintage 100% cotton bias tape which had been given me by my Grandmother. The single back neck closing button is a wood-looking plastic coming from the stash of my hubby’s Grandmother. TOTAL COST: The 2 ½ yards I used were bought at Hancock as it was closing, so I got a good deal – maybe a total of $10. Now, just to clarify, I am not attempting to knock-off something designated as special to this race, like how Pendleton has lately been misusing the Native Americans “trade blankets” and Navajo prints. I am merely trying to highlight and recognize the beauty and art of another culture through fabric, as well as taking this as an opportunity to learn about the past. In 1930’s and the 1940’s, Native Americans were still not represented well at all…even though more than 44,000 saw service on all fronts. However, by the late 30’s things were taking a good turn. 1938 –the date of my dress – was the year the Bureau of Indian Affairs (BIA) estimated the number of potential registrants for a draft in case of war (Hitler was then occupying Austria and Czechoslovakia). The Navajos especially answered the call in force, with many of those enlisting seeing a big city for the very first time and many being in their early teens posing as older young men. About 400 Navajos were chosen for a special WWII code unit (in 1942) to develop secret messaging for use on the Pacific front, offering the U.S. a code which could not be broken. On a more personal level, 1938 was also the beginning of the first established high schools and centers for education on reservations, to bring more progressive and wide spread learning sponsored by the BIA (Bureau of Indian Affairs). Previously, the “Indian New Deal” of the Depression played down schools and learning for this race. The Indian division of the CCC was building more community buildings, lands were being granted back in 1938 and ’37, natural resources on their lands were protected by the “Mining Act”, and Anglo writers were transcribing oral tradition into written form. No group that participated in World War II made a greater per capita contribution than Native Americans, and between this fact and changing attitudes, the time period before and after 1938 was one of significance for these people. 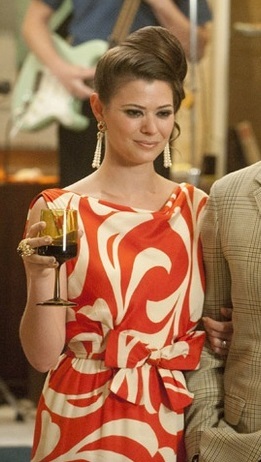 I would like to recognize this and let my dress do the extra showing of respect. This dress’ design is stunningly complicated in appearance but ridiculously simple to construct. 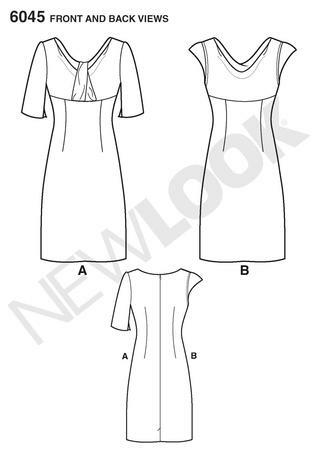 No kidding – it’s like the magically appearing pattern…only four pieces for my dress and 4 hours later…a dress! This pattern has one basic body design, but there are three sleeve options and the ¾ sleeve is by far my favorite. I meant to do the short sleeves but they seemed to overwhelming to the dress so were left off. 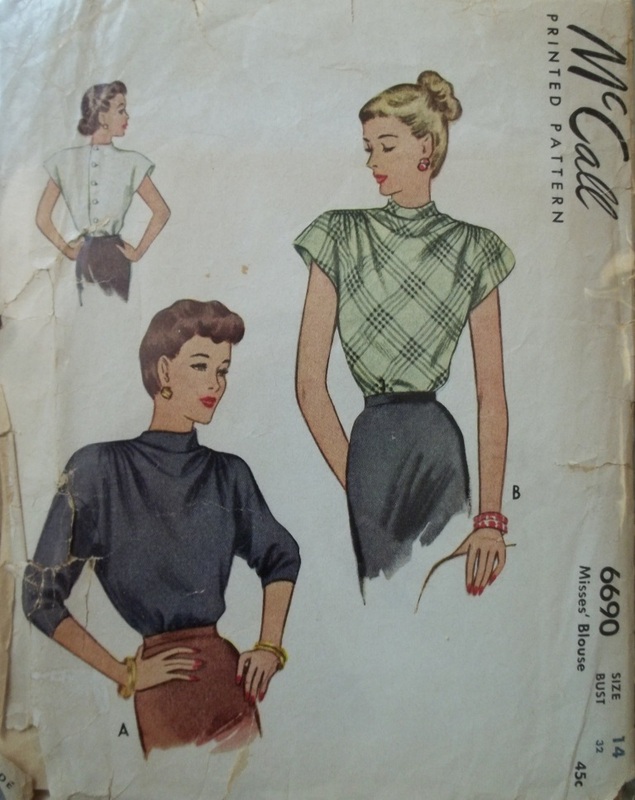 The pattern I have was bought at a very reasonable price because it was missing the skirt pattern pieces but no biggie – this basic shape is on a pattern I already have used (not posted yet), New York #531. All the details are in the bodice and sleeves anyway. The side closing here is one of its kind in my wardrobe. It is a combo of both a zipper and a snap closure to not constrict the silhouette of the dress. From the waist down there is a zipper, sort of a hard thing in a bias skirt, and from the waist up is a snap closure to keep the bodice draping well. This was kind of tricky to finagle, but it gave me the opportunity to use up two small remnant pieces of snap tape floating around in my “scrap notions” drawer! 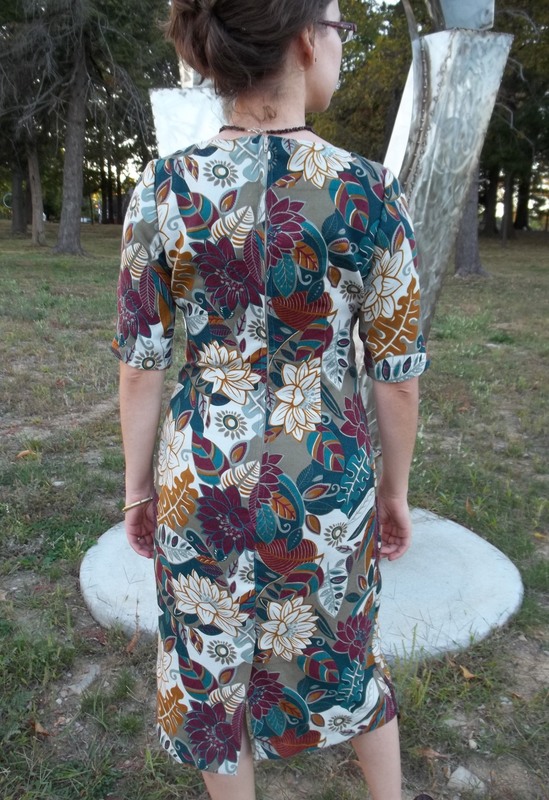 My biggest fear with this dress was being sewn from a print might make the bodice details disappear, but I figured (I think correctly) that a larger, especially geometric pattern would show best what is going on at the shoulders with the triple rows of uber-ruching. 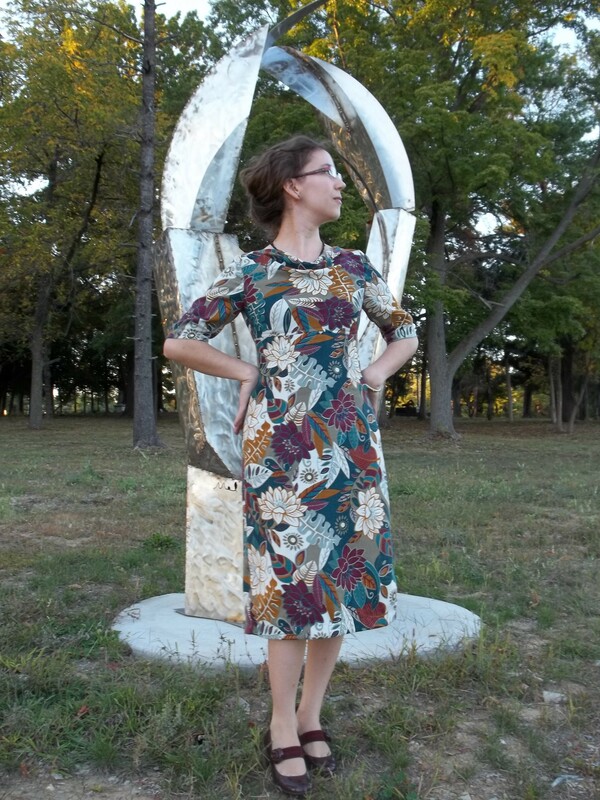 I cannot wait to make another, dressier version of this dress out of a rich, deep colored solid jersey rayon. 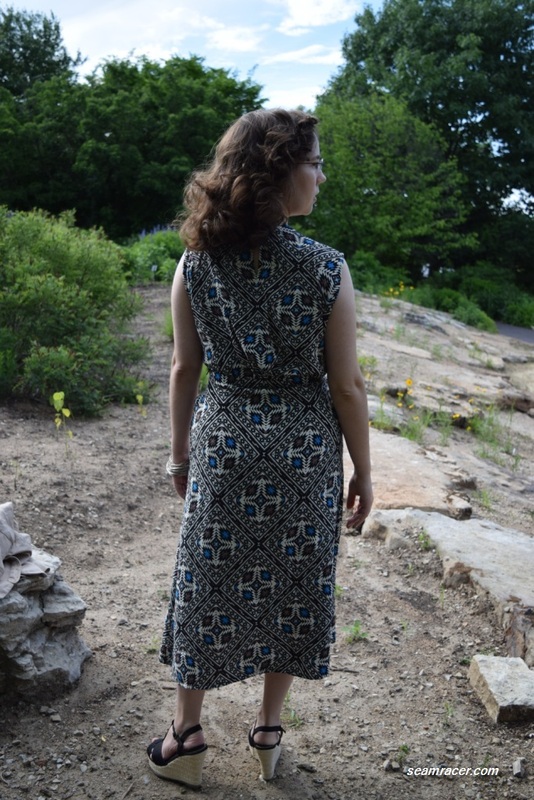 For now, I am quite happy to have a vintage dress that is so versatile and comfy, as well as a tribute to the history of America’s “first citizens”. 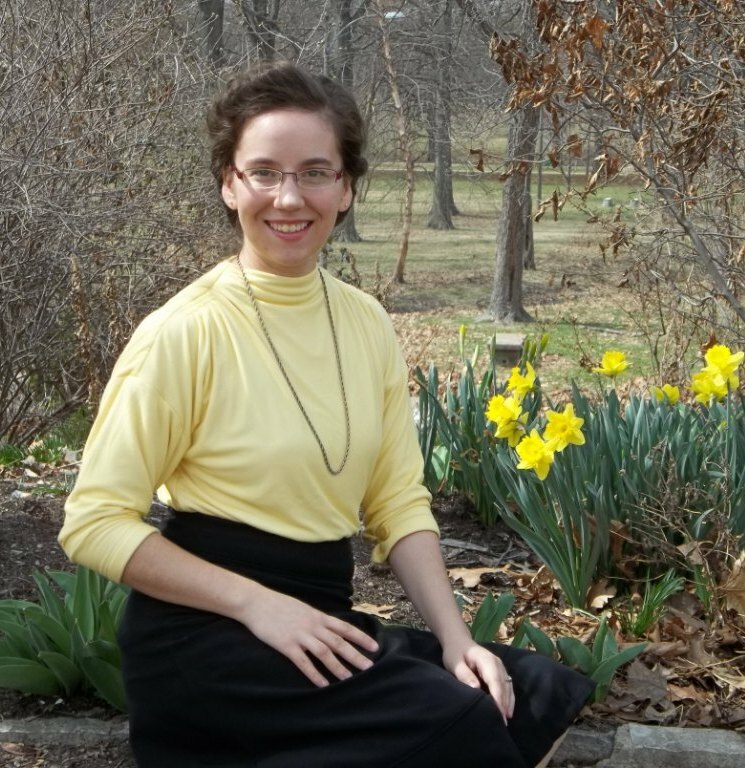 Generally, we tend to think of the color green and the unspoken symbol of “Go!”, but I see the color of yellow as the shade which signals “go” – the start of the season of spring. 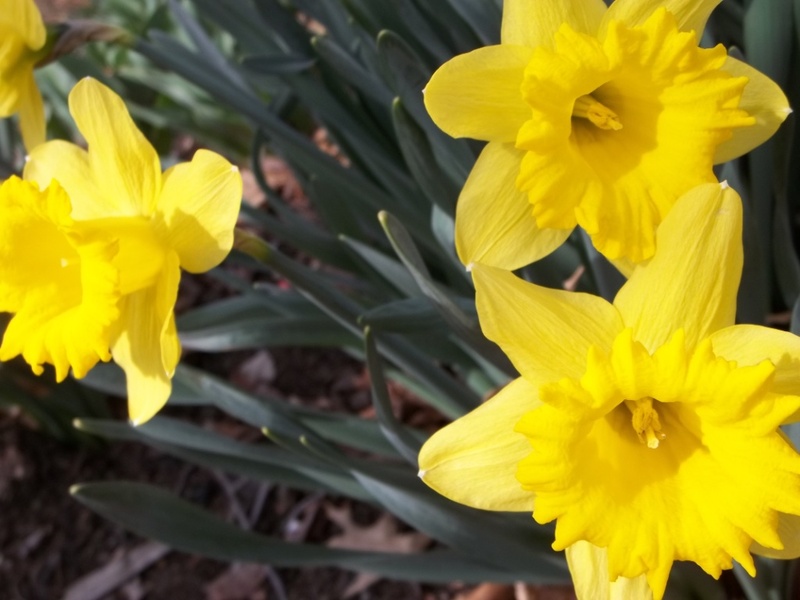 Where I live in the middle of America, the jonquils, daffodils, forsythia bushes, crocuses and other first spring buds which pioneer open almost always wear a shade of yellow. There must be something good there. However, for being such a bright and cheery color worn by the promise of nice weather to come, we as humans seem to often shy away from yellow, leaving it to nature to show it off. Not too many people in my experience seem excited to wear tawny tones, and I would like to change that perception, at least a little bit, with this post of my new 1940’s draped neck knit sweater top. Why just let the flowers show off this spring?! Find your own shade of yellow to like (or at least tolerate), pick an awesome pattern, and you can’t go wrong “showing off” with the blossoms! This post is part of my “Agent Carter” sew along. 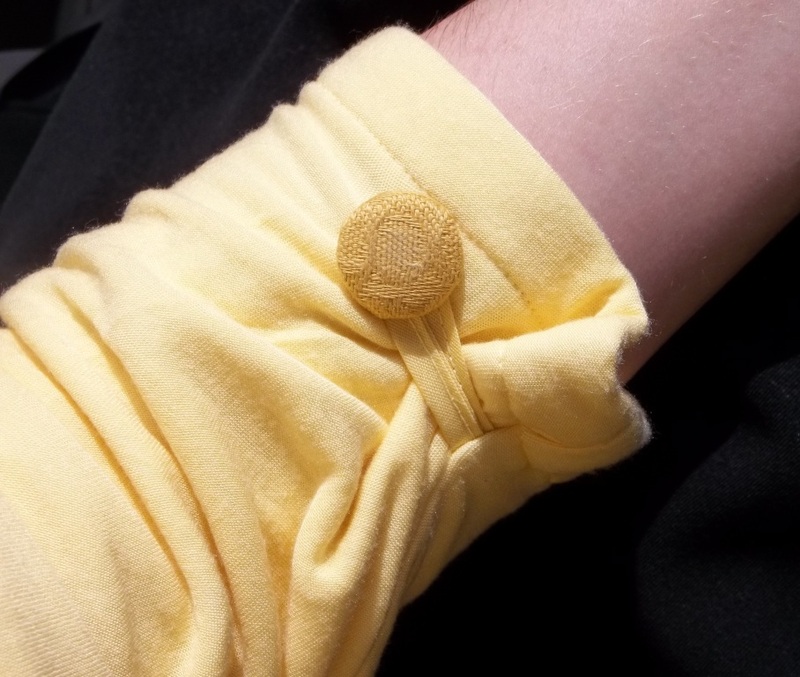 FABRIC: The yellow knit is 100% rayon, backed with a 96% rayon/4% spandex white knit. I backed the rayon knit with the white blended knit because the yellow fabric was extremely “tissue” thin (see through) and the small percent of spandex helps the overall drape. NOTIONS: I had all the thread, interfacing, and bias tape needed on hand in my stash already. The buttons are vintage from hubby’s Grandmother’s stash. TIME TO COMPLETE: This top was quicker to make than I originally expected from merely looking at the pattern. However, I did take a bit longer on its construction as I wanted this top to have very fine finishing. From start to finish my blouse took 8 hours or less, and was finished on February 20, 2015. 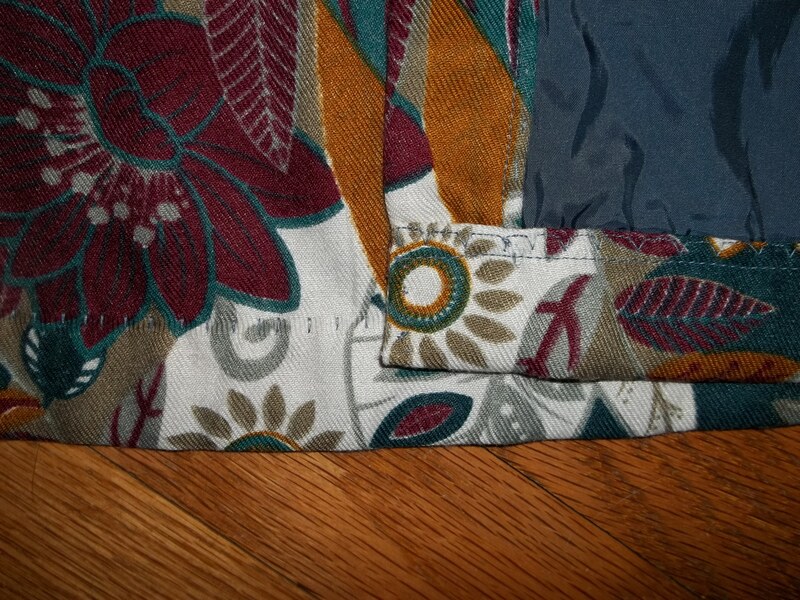 THE INSIDES: All seams are in French seams, except for the hems, of course – time consuming but so worth it. The long seam which runs down my shoulder is finished inside by being covered in bias tape so that it doesn’t stretch out of shape. TOTAL COST: This is a hard one to figure. 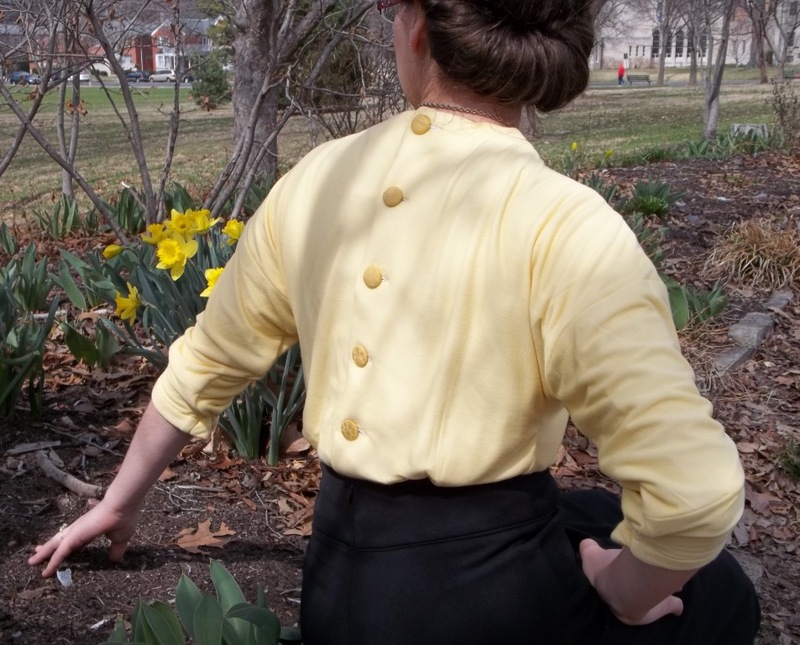 I bought a large 3 ½ cut of this yellow rayon knit from Fashion Fabrics Club, but only used about 1 ½ yards to make this 1946 blouse (the rest is going towards two other projects). 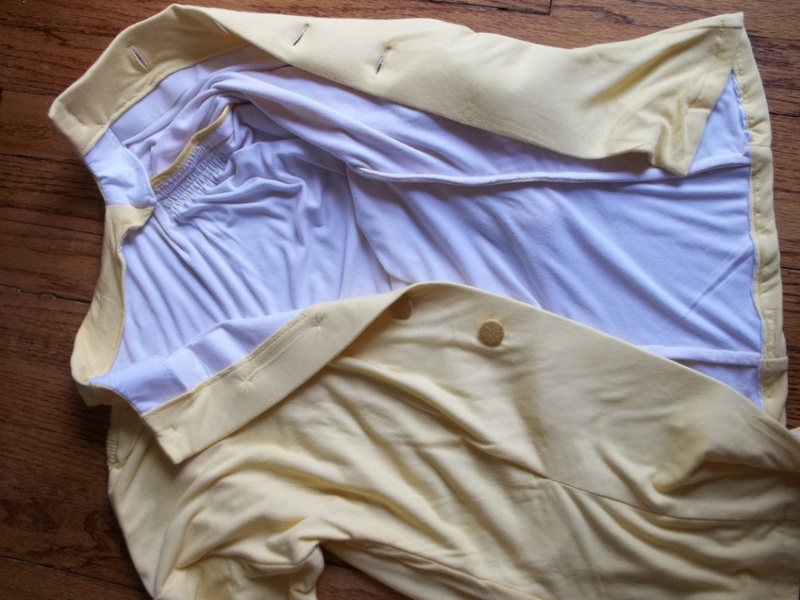 The white ‘lining’ knit was bought from JoAnn’s store, in the same amount as the yellow knit. Both fabrics were about $9.00 a yard. So, I suppose my blouse has a total cost of about $30. Yikes! This is more than what I normally like for a total cost, but I’d rather spend more to have quality. Oh well. I’ll admit straight up that I can’t knit and crochet, or at least don’t currently. (Not that I wouldn’t like to re-learn in the future everything my mom taught me about it.) Thus, in lieu of having a classic knitted 40’s sweater top, I went for a loose, ultra drape-worthy rayon knit with all the cozy and fashionable feelings of what I imagine a sweater top to be. Several of the hard working, down to earth, regular female characters in the television series “Agent Carter” wore some amazing sweater knits. All you needed was your skills, some yarn, a pair of needles, and a pattern to guide you…how reasonable could you get?!! The sweater tops I saw in “Agent Carter” had interesting designs as part of their construction, and were in rich, beautiful colors which could match with many basic skirts – neat! (See the character Angie in the pretty sweater top, crying to Agent Sousa.) I have to make my own version of one of these tops yet. Even though my top is not as form fitting, with the classic pouf sleeves and banded bottom of hand knitted 40’s sweater tops, my top does have some the best that the 30’s and 40’s blouses have to offer. It has beautiful features (if I must say so myself), is easy to match with my other separates, has a snuggly comfort, and makes the most out of the features of my chosen pattern. The draping makes me think of elegance, it’s no wonder this design of blouse was used for two decades. Here’s easy proof…1.) 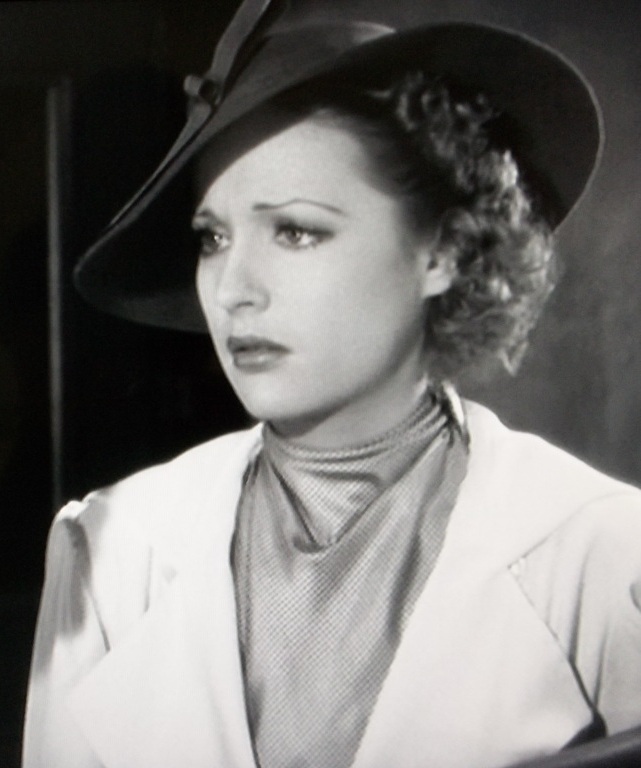 the movie “Gold Diggers of 1937” has one of the four major leading ladies, Irene Ware, at left, wearing a top exactly the same as my 40’s yellow one, and 2.) 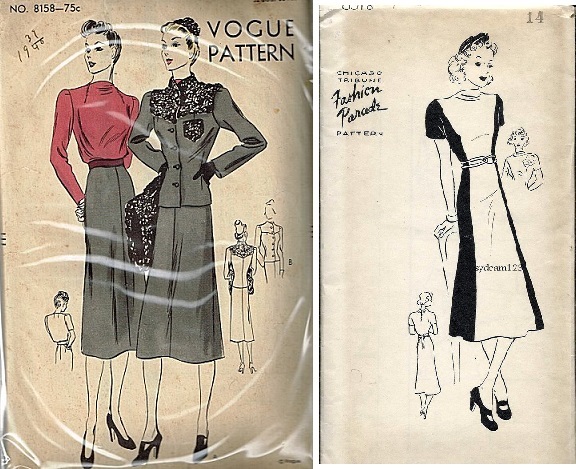 a duo of late 30’s/early 40’s patterns, at right: the same high drape across the front of the neck and slimming silhouette. 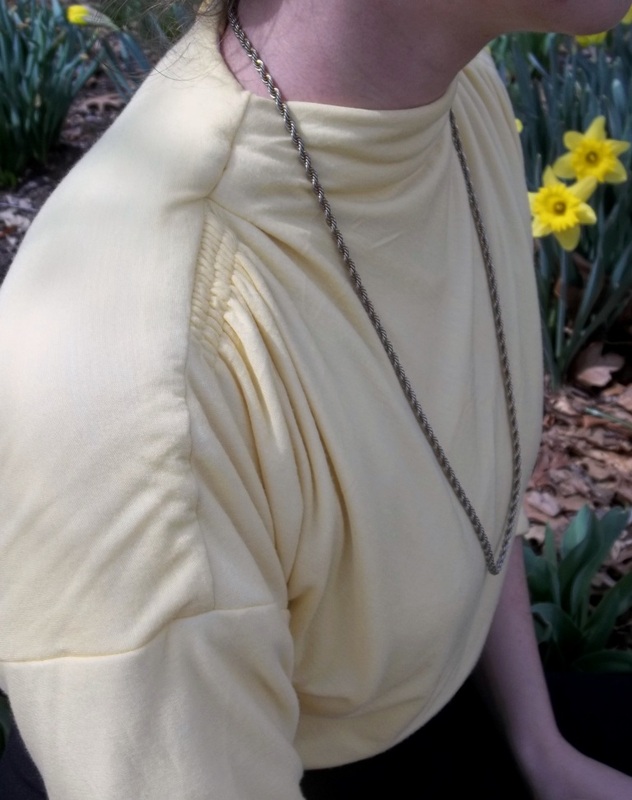 Several rows of runching are used to gather the fabric at the front of my yellow blouse’s top shoulder seam, creating the gathers which drape down the top and around the body. 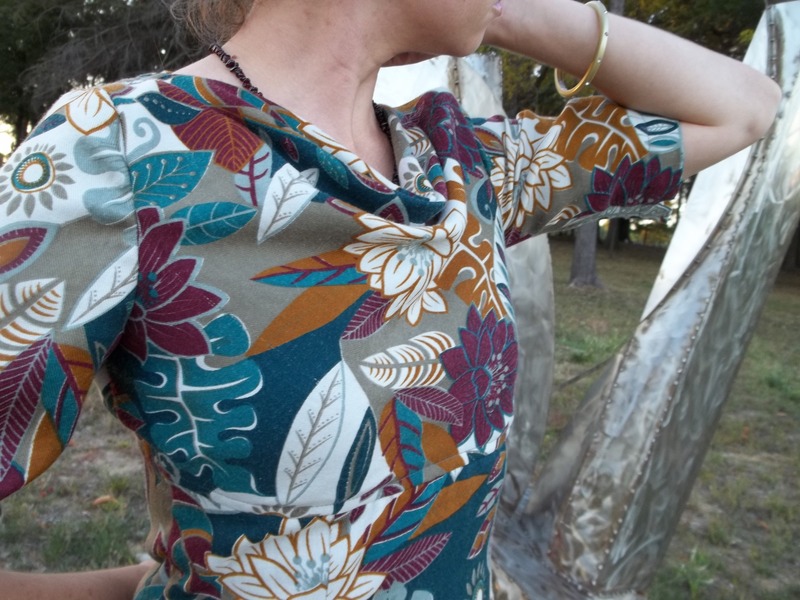 The short sleeves of my blouse are a kimono sleeve (very common for the mid-1940’s). However, adding on the quarter length sleeves turns them into a wide, dramatic dolman style, with a button and loop closure bringing in the ends to hug the elbow and taper in the end. 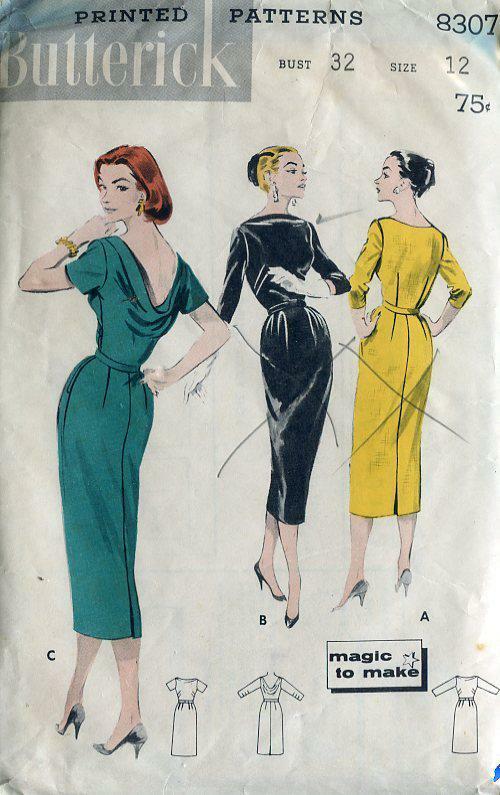 There are four of the conventional tucks in the lower body of the top, too, from the waistline down, and one tuck on each side of the neck front to add shaping/draping. With all the interest and details at the blouse’s front half, the back button closure adds a touch of unexpected interest and beauty. I guess you can tell I love 1940’s tops – each one is like an individual, having its own subtle beauty and quiet, underrated personality. 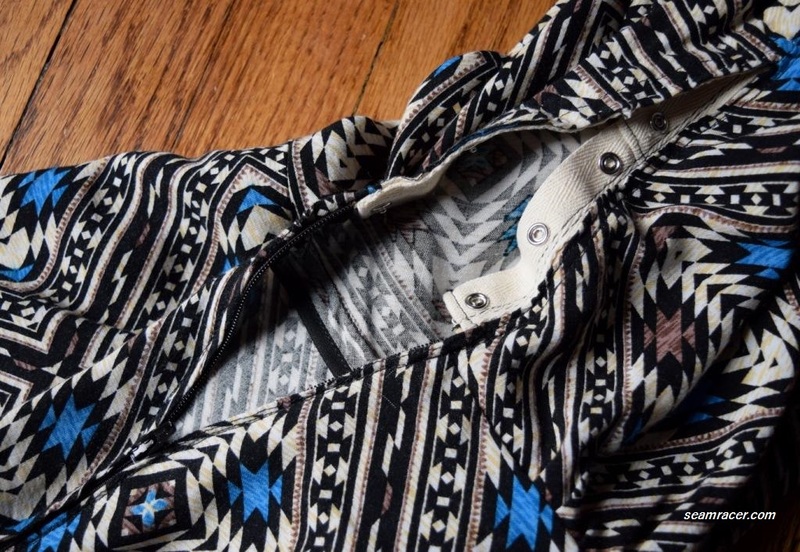 This blouse might appear hard or complicated, but it is really simple and easy actually. 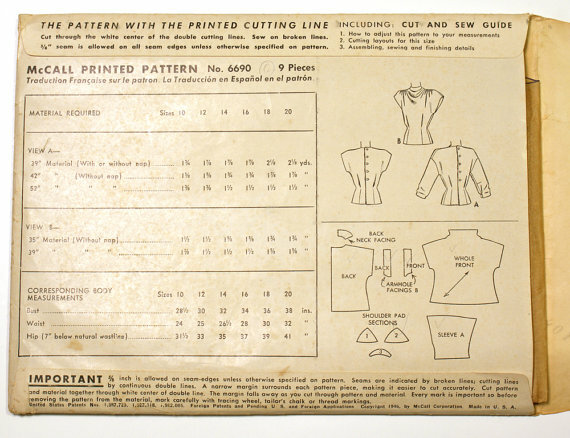 Glance at the pattern envelope back and you can see that there is one big piece which is the entire front with one piece (cut twice) making up the back. There is really only one facing piece (cut twice) for the back neck because the front neck and the back buttoned edges are self-faced. The optional ¾ sleeve is one big piece, and there are short sleeve hem facings. It actually took more time to do the blouse’s markings than it took to do the cutting and preliminary sewing of the darts. Just like for a perfect wrap (or fake wrap) knit dress you still need certain parts stable, I used interfacing and bias tape to keep a few spots on my yellow ’46 top from stretching or draping like the rest of the garment. 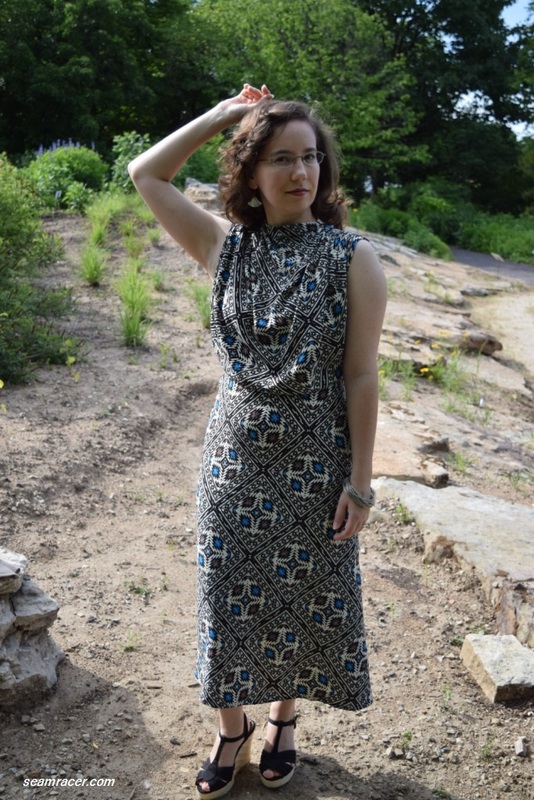 I learned a thing or two about stabilizing knit garments before making my modern water colored knit dress (see post here) from reading a Threads magazine article in their September 2013 issue. I applied these pointers to making this top, as well, by adding interfacing to the length of the back button self-facing. The interfacing is lightweight, and its width goes from the self-facing edge to the fold line. Doing this helped me attain a crisp folded edge to the bouncy fabric and it kind of made the back a bit heavy, which is good, actually, because it keeps the front drape against my neck. The buttonholes on one side and the buttons on the other keep the facing in place, and hand-stitching the facing edge to the white knit lining kept the rest of it down. As I said in “The Facts” above, bias tape runs along the kimono sleeve shoulder seam from the neck to the where the ¾ sleeve comes on. The bias tape is not 100% stable, but it does keep that seam from stretching unless I physically pull it. Happily, hubby’s Grandmother’s collection of buttons provided an amazing set to go down the back of my top. 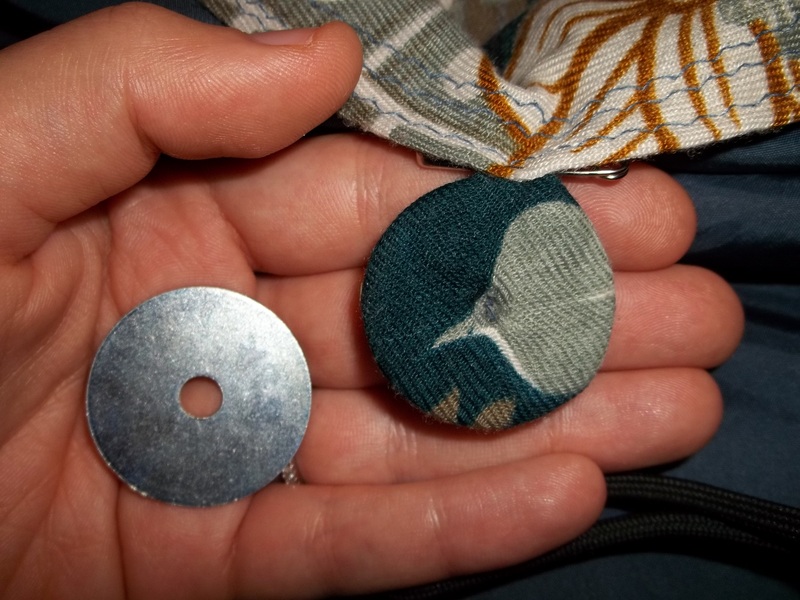 There was the exact amount I needed (five for the back, two for the sleeves), and are handmade out of button blanks with a loosely woven dark yellow tapestry. One of the set is missing the backing piece which gets snapped on, but that’s o.k. 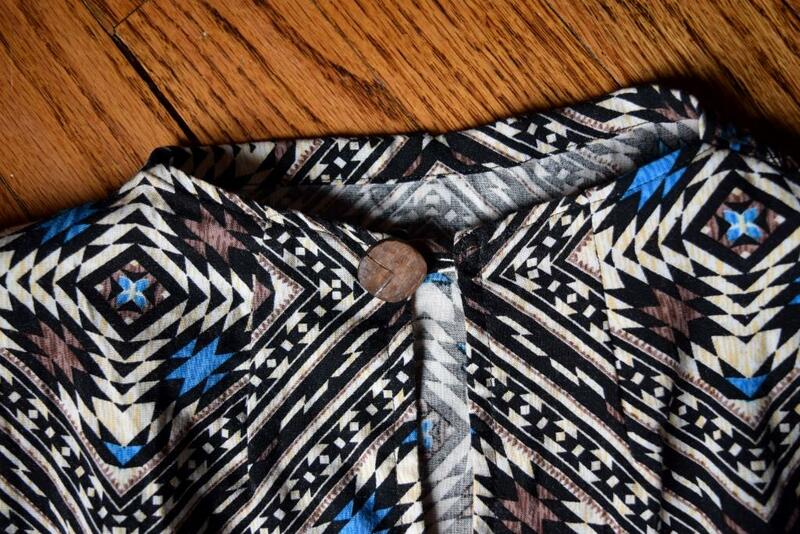 – the raw edge underneath had already been hand stitched to keep the button covered. There’s a part in the back of my head that tells me these yellow buttons must have come off of a suit coat or even off of a piece of furniture. I’ve already had someone ask me, “Where’d you get those buttons? !” That’s the big, happy advantage to using vintage notions – they quietly standout. I’ve never had sleeves end like the ones on this yellow ’46 top and I like it! 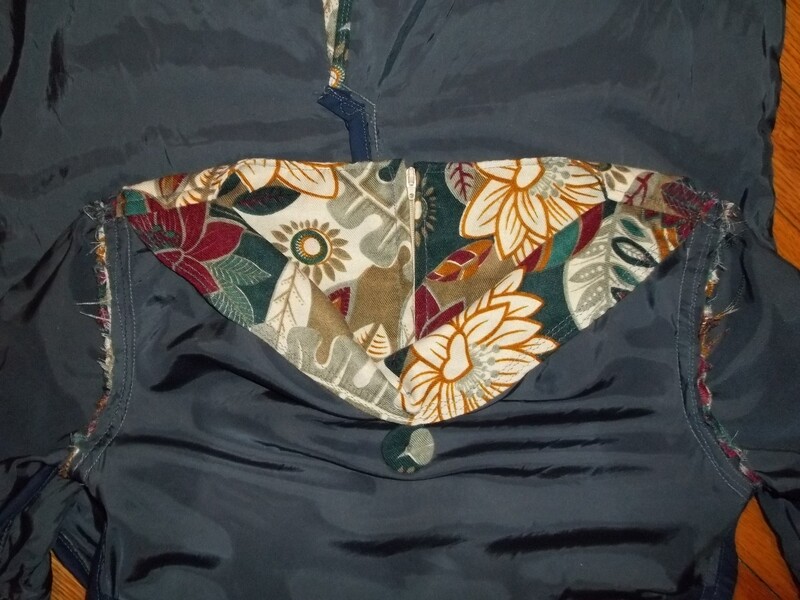 I used small strips of bias tape to make loops which were sewn into the sleeve seam bottom. Then, I tried on the sleeves for fitting and put a little square of interfacing under the spot where I chose to sew the button. The sleeves actually do stay up just under my elbow without bothering me at all. For a woman in 1946, I’m guessing that this pattern would probably have been made out of a satin, some sort of silk, or even a rayon crepe or challis. Knit jersey fabrics had been around since the late 20’s or 30’s, so my using it isn’t far off historically, except for the artificial spandex in the white lining. I think using a knit is a nice twist – it clings in a very complimentary way without being too racy. 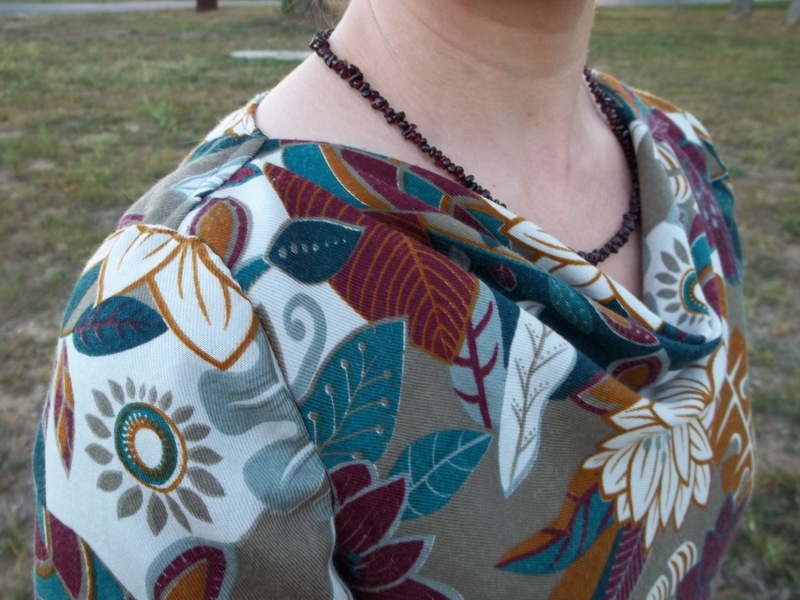 I don’t think I could have attained this with a chiffon or other light weight fabric, although I would like to try one of these fabrics to make this blouse again in the short sleeve version for warm weather wear. 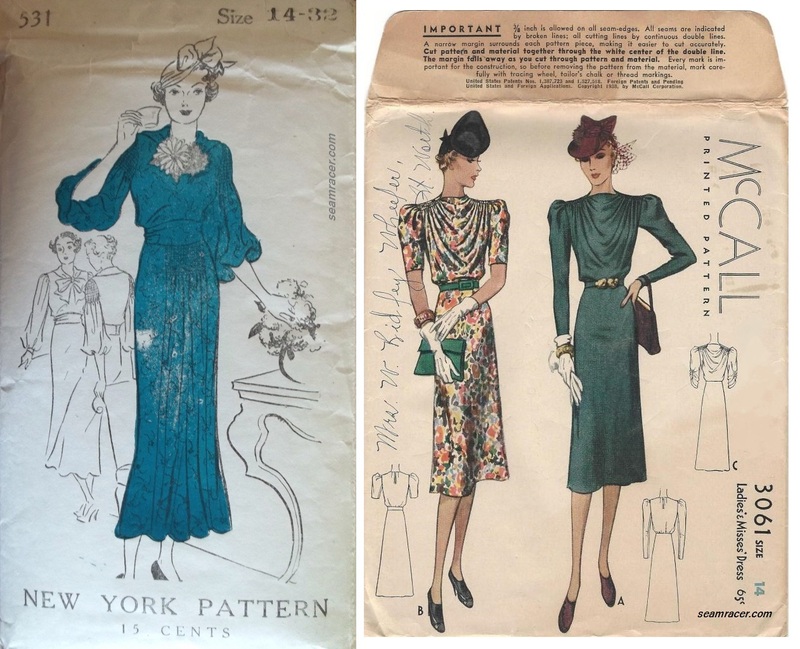 The decade of 1940’s used all sorts of unexpected materials, colors, and patterns in the things they wore. How about trying to experiment with some for yourself. Who knows? Maybe you’ll find a new favorite. For myself, I know like yellow more than I would have imagined previously. (Here are my first, second, and third yellow creations.) Now I just need to work on liking pink, another color of spring!